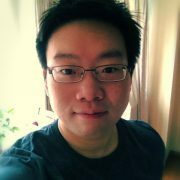 Jan. 2012: Our LiveSynergy paper “Design and Evaluation of a Wireless Magnetic-based Proximity Detection Platform for Indoor Applications” is accepted to ACM/IEEE IPSN 2012 with a 15% acceptance rate (22/148)! Nov. 2011: Our LiveSynergy demo “Creating Interactive Virtual Zones in Physical Space with Magnetic-Induction” wins the Best Demo Award in ACM SenSys 2011. Manufactured 40 LivePulses and 25 LiveLinks for deployment. Performed experiments using LivePulses and LiveLinks in the Microsoft cafeterias to evaluate LiveSynergy for context-aware targeted-advertisement applications. We found LiveSynergy to be ideal for this type of applications due to its consistent and sharp zone boundaries. Created a Windows Phone 7.5 app, which offers context-aware and personalized advertisements and diet suggestions at a per-counter granularity. Created a web portal for commissioning and managing virtual objects (a large subset is based on LivePulse zones), with a GUI for creating custom triggers that link objects together using their events and methods. Pulse (left) consists of four primary hardware components: microcontroller (MCU) and radio, magnetic transmitter tuned at 125kHz, energy metering, and a mechanical relay for actuation. Link (right) is a mobile device carried by humans to receive and decode the IDs from dynamic magnetic fields transmitted by Pulses. 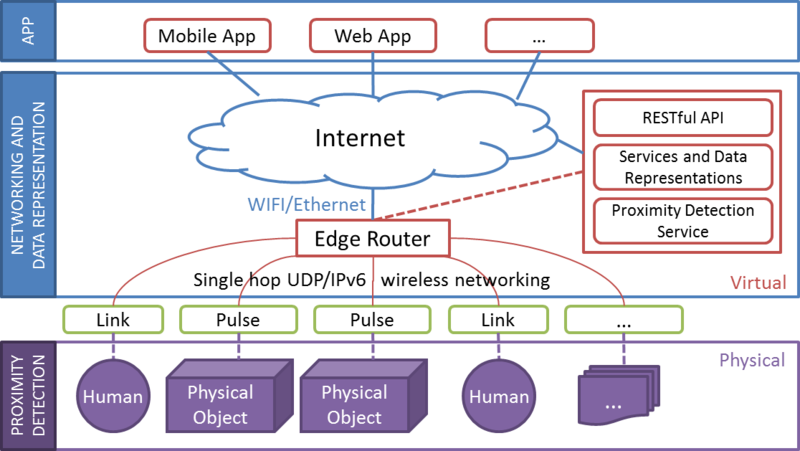 Building on top of this magnetic-based wireless proximity detection platform, we provide cloud-based APIs that enable real-time and rich interactions between humans and their physical environment, as seen in the system architecture below. End-to-end system architecture includes three main components: the hardware platform for detecting when humans enter and exit cafeteria counters; a networking and data representation layer enabling communication among counters, services in the cloud, and app clients; and an application layer consisting of a mobile application for providing feedback and visualization. LiveSynergy enables a range of indoor applications such as location-based targeted advertising and presence detection. 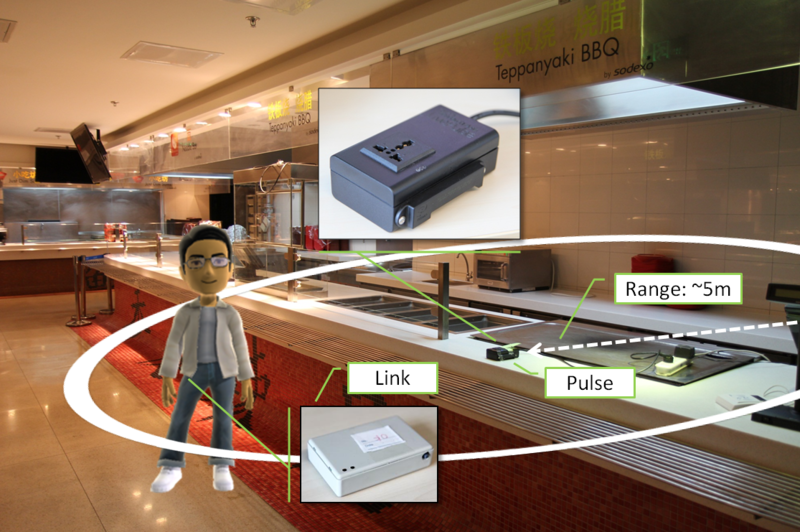 Take the location-based targeted advertising as an example, a Pulse, installed at the Teppanyaki counter is projecting a proximity zone of 5m radius. Links carried by diners in their pockets detect this zone as they enter. When his Link detects the Pulse ID of the entrance and forward to the server, our web service sends a notification message to his mobile phone. The phone displays a notification at the top of the screen without interrupting the foreground application (Internet Explorer). Clicking the notification opens the main screen of our mobile application with the menu and promotional items. At the “Japanese counter”, the web service pushes counter-specific coupons (tuna sashimi). And more interesting location-based application can be built reliably on top of our platform. The diners receive the notification upon entering the café, which do not interrupt the current web browsing. After clicking the notification, today’s menu is available from a RESTful server, so diners can have a more convenient way to order. Coupons or other location-based services can be delivered to diners when he move towards this counter.